Our models are powered by electricity, and at very high power levels compared to most battery operated equipment. In the non-modeling world, any electrical circuit fitting that description will be equipped with a fuse (or a circuit breaker), a small device which is designed to disconnect power from the circuit if there is excessive current flow. Any building with electrical wiring in it will have a fuse box in which you will find a dozen or more fuses, each protecting some part of the house wiring (many recently built houses have circuit breakers instead of fuses, but they serve the same purpose). If you’ve ever plugged too many high power appliances into a group of wall outlets on the same circuit, you will probably have blown a fuse and had to replace it. Cars too have fuse boxes, often situated for maximum inconvenience when it is necessary to replace one. Unlike house fuses, car fuses most often blow when there is an electrical problem, instead of from plugging in one too many appliances. This 30 Amp fuse in my Sig Riser 100 is in the positive battery lead. A fuse serves two purposes. First and foremost, it is a safety device, protecting against fire. Its secondary purpose is to protect the equipment on its circuit. A wire is not a perfect conductor. It has some amount of resistance, which increases with length, and decreases with cross-sectional area. For example, 18 gauge house wire has a resistance of about 0.0064 Ohms per foot. When current flows through a wire, some power is lost because of this resistance (recall that power equals current squared times resistance). This power is lost in the form of heat. For example, suppose there is a current of 10 Amps flowing through 50 feet of 18 gauge wire (such as might be the case for a 1200 Watt heat gun with a 5 foot cord, plugged into an outlet 20 feet from where the power enters the house). The power lost would be 10 x 10 x 50 x 0.0064 = 32 Watts. This will cause all the wire involved to get slightly warm, but nothing to be concerned about. Now suppose that the heat gun develops a short circuit where the wire enters the handle. This means that the electricity flowing through the power cord will only have to travel through the 50 feet of wire, which has a resistance of 0.32 Ohms. Ohms law tells us that the current then flowing will be the voltage divided by the resistance, or 120 Volts / 0.32 Ohms = 375 Amps! The power loss in the wire will then be 375 x 375 x 0.0064 = 45000 Watts!! This would melt not just the heat gun’s cord, but all the house wiring supplying power to the outlet that it is plugged into, in a matter of seconds. It would probably also start a fire. 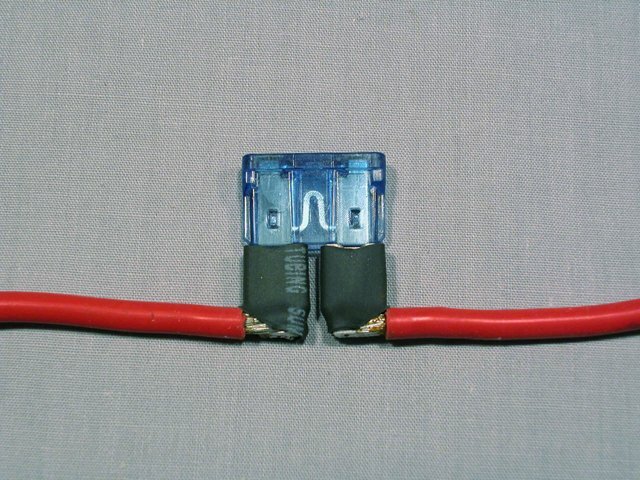 However, if the circuit that the heat gun was plugged into was protected with a 20 Amp fuse, the extremely high current caused by the short circuit would blow the fuse within a matter of milliseconds, cutting off the power long before anything had a chance to heat up, and saving the day (and your house). Suppose that instead of your heat gun developing a short circuit, something goes badly wrong at the power generation company, and the voltage at your outlet suddenly increases to 300 Volts for a few seconds. Your 1200 Watt heat gun, instead of drawing 10 Amps, will now draw 25 Amps, and will become a 7500 Watt heat gun until it burns out. However if the manufacturer thought to install a 10 Amp fuse in the heat gun, the fuse would blow first, protecting the heat gun from damage (in reality, there probably would not be a fuse in the heat gun, since this sort of voltage increase just doesn’t happen on the power grid). A fuse is probably the second simplest electrical device in existence, after the wire. As a matter of fact, the working part of a fuse is just a short length of thin wire with a low melting point. Like all wire, the fuse has some resistance, and current flowing through it causes the wire to heat up. Below the rated current of the fuse, the wire remains well below its melting temperature, and current continues to flow. But if the current increases, the wire will heat up more, melt, and break the circuit. 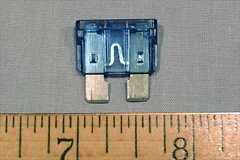 A typical automotive fuse. 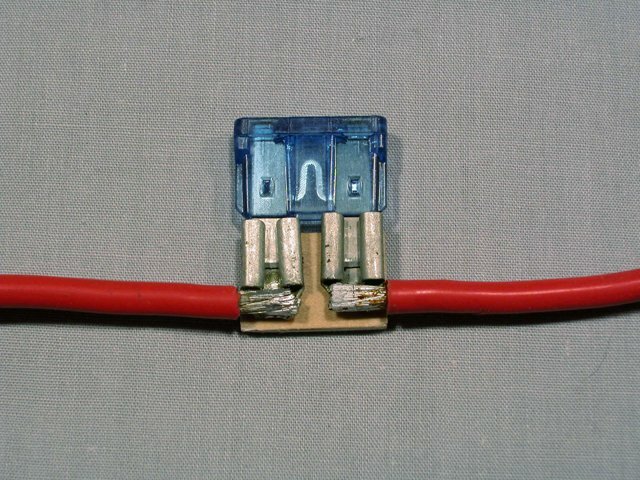 The short length of thin fuse wire is visible between the two spade connectors through the fuse body. In order that the melting wire in the fuse not start a fire, it is generally inside a fire proof or at least heat resistant enclosure. Household fuses are encased in glass, as are the small cylindrical fuses often found in electronic equipment and in some cars. Modern car fuses are made of heat resistant plastic. Some modelers feel that a fuse wastes power. After all, it has a higher resistance than that short length of super-duper high-flex silicone-insulated 12 gauge wire that it’s replacing, so isn’t it counter-productive? In theory, yes. In practice, it makes very little difference. 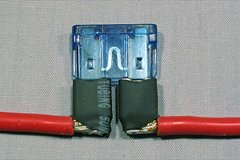 Replacing a six inch length of 12 gauge wire with a six inch length of fuse wire would make a big difference, but for the 1/4 inch or so of fuse wire in an actual fuse, it’s hardly worth worrying about. A fuse has a rated current that it can withstand indefinitely without the wire inside melting. If this current is not exceeded, the fuse should never blow. However, a fuse is not an all-or-nothing device. The rated current can be exceeded without blowing the fuse, as long as it is not exceeded by either too much, or for too long. Extremely high currents will blow the fuse almost instantaneously. Currents only slightly above the rating will take longer to blow the fuse. For example, it could last for hours in a 10% over-current condition. Some types of fuses carry a "slow-blow" rating, which means that they can handle moderately high currents for a short time without damage. Such a fuse might be used in an appliance containing a motor. If the motor is rated to consume 2 Amps during continuous operation, it could be protected by a slow-blow fuse. When the motor is first turned on, it will draw much more than 2 Amps for a few seconds, and the slow-blow rating of the fuse ensures that the fuse doesn’t blow every time we start the motor. As an aside, some modelers have attemtped to use fuses as a means of measuring current. Because of the way that fuses blow at different rates under different current levels, this is not useful. Just because a 25 Amp fuse did not blow during your 20 second motor test does not mean that the motor is drawing less than 25 Amps. Due to variations from one fuse to another, it could be drawing even as much as 35 Amps without blowing in that period of time. The only reliable way to measure current is with a low-resistance ammeter, a low-resistance shunt and a precision digital voltmeter, or a clamp-on DC ammeter. Where Does the Fuse Go? A general principle of fusing is that the fuse be installed as close as possible to the power source. If the fuse were installed far from the battery, a short circuit could still develop in the part of the wiring that is not protected by the fuse. By installing the fuse close to the battery, the only thing not protected against is a short circuit within the battery itself. In the early days of electric flight, there was only one place to consider putting the fuse, and that was in one of the leads between the motor battery and the motor control (usually in the positive lead). Typical fuse locations in brushed motor power systems (diagrams by MotoCalc). In an over-current situtation (such as might happen if the propeller were stuck in the ground with power still applied to the motor), the fuse would quickly blow, preventing a fire, and protecting the battery, motor control, and motor from damage. Many modern electronic speed controls (ESCs) are equipped with a battery eliminator circuit (BEC). This provides power to the receiver and servos from the motor battery, eliminating the need for a separate receiver battery (which saves weight, and makes for one less battery to charge). Unfortunately, this affects the placement of the fuse in the circuit. 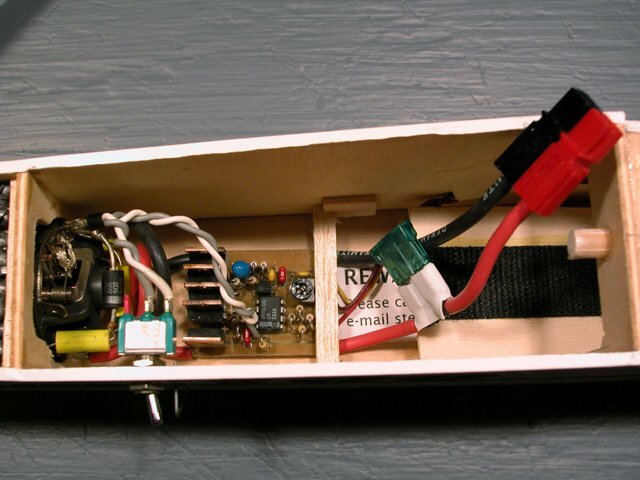 If the fuse in a BEC-equipped plane were placed between the battery and ESC, an in-flight over-current situation (due to a short-circuited motor winding for example), would cut power to the ESC, and hence also to the receiver and servos. The result would be loss of control, and very likely a crash. Therefore, BEC-equipped models must have their fuse installed between the ESC and the motor. This will still protect against the most common sources of over-current situations (stuck propellers and short circuited motor windings), but not all (such as a short-circuited speed control). In a brushless motor power system that is not BEC-equipped, the fuse goes in the same place as it does in any non-BEC system: between the battery and the speed control. However, in a BEC-equipped brushless system, there is no place for the fuse. A brushless system can only use a fuse if it does not use a BEC. Because the motor has three power leads instead of two, putting a fuse in any one of them will still allow one set of windings to be energized by the speed control via the other two power leads. Butwith only one of the three sets of windings now attempting to keep the motor running, the instantaneous currents will be much higher, and speed control damage will result. Putting fuses in all three leads will not help, because the average current may still be low enough to not blow the fuse. To get around this problem, many brushless ESCs (and some brushed ones) have built in over-current protection. Instead of a fuse, they measure the current flowing through them, and if it is too high, they simply shut down the motor. Even if your ESC has such a feature, it is still advisable to use a fuse in a non-BEC and/or brushed power system, since over-current protection cannot protect against a short-circuited ESC. The most commonly used type of fuse in electric flight is the automotive spade fuse. 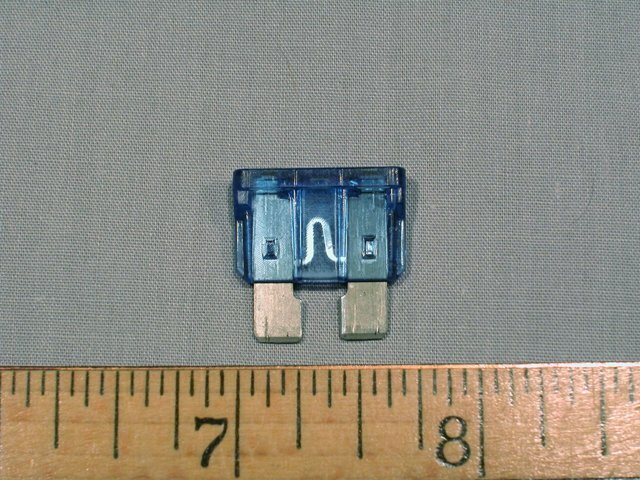 These are small, light in weight, and available in a variety of current ratings from 1 Amp to 30 Amps. Larger spade fuses are available up to 60 Amps. It is tempting to use a fuse holder from the auto parts store, but this has some drawbacks. 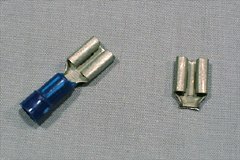 One is that the connectors inside the holder are not accessible or visible, and repeated insertion or removal of the fuse can result in poor connections (some modelers use a fuse as an arming switch, and thus only insert it before each flight). Secondly, most fuse holders come with fairly stiff 16 gauge wire leads, which are prone to breakage in the tight confines of most electric models. Finally, these fuse holders are somewhat bulky, making it even more difficult to squeeze them in. 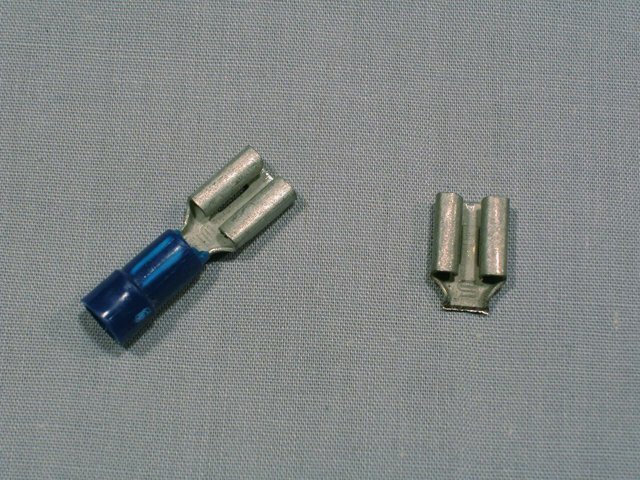 Two female spade connectors that will be turned into a simple fuse holder. One has had its sleeve cut off already. The motor power wires have been soldered to the conenctors at right angles. Small pieces of heat shrinkable tubing, notched out to clear the wires, complete the job. The connectors can be glued to a small scrap of plywood to make a more rigid fuse holder. 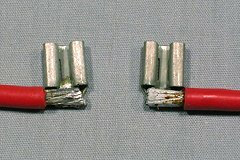 My personal favourite fuse holder is made from a pair of female spade connectors, with the crimp sleeves cut off, and power wires soldered on at right angles. 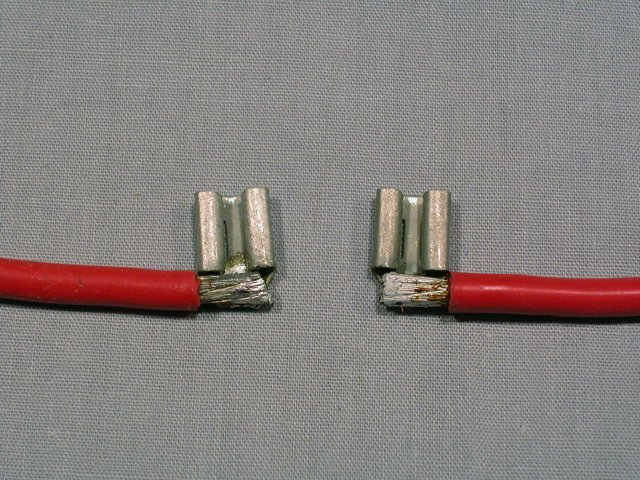 Heat-shrinkable tubing insulates the two connectors from each other. When these connectors become worn or loosened, a quick squeeze with a pair of pliers makes them as good as new. 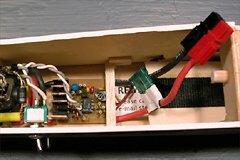 If you wish to be able to easily plug and unplug the fuse, the connectors can be glued to a small scrap of plywood. Otherwise, just leave them loose on the wire ends, which gives a fuse holder that takes up only a bit more space than the fuse itself. Please refer to the photos for details. Multi-motored models need fuses too. Here is a series-wired brushed twin with BEC. 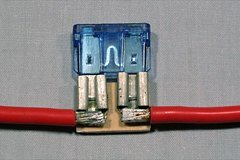 In very small models, it may be desirable to use mini-fuses (used in some cars), and to solder the power leads directly to the fuse terminals. This makes fuse replacement a chore, but in normal use, the fuse will rarely need to be replaced (and a butane soldering iron will make field replacement possible). Given what we know about fuses, there’s really no reason not to use one unless it simply isn’t possible. Don’t risk the safety of your model or your field by leaving out this simple piece of insurance. Another excellent write up by Stefan! Just one comment, when a fuse blows it can tell you something about a failure mode, by what blown fuse looks like. a) Completely blown, element vaporized, inside of fuse ‘carbon’ black means the circuit has a ("dead") short circuit. b) Fuse element simply melted til a gap appears, blown due to simple overload. fuse holder simply great idea . love it. thanks for sharing it. Will be making few for my car soon.